Bill Thompson, publisher of the magazine Birdwatcher’s Digest, interviews Mitchell Waite about the evolution of the digital field guide and how iBird fits this vision. The interview is about 27 minutes long. There will be a small delay as it loads into your computer so be patient. Bill explores what experience got Mitchell thinking about replacing a traditional printed field guide. Mitchell discusses the obstacles he faced, the first of which finding artwork for over 800 species of North America. He had to decide between photographs verses paintings, the costs of which he discovered were enormous. The use of outsourcing and crossing international boundaries was his solution. Surprisingly it was not the technology that got in his way nor was it people working on dirt floors in the middle of rain forests. To start the interview and learn about these fascinating issues click on the link below. 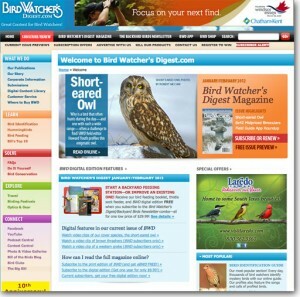 If you are serious about birding Birdwatcher’s Digest is the best magazine on the market. Click on the image on the left to visit the BWD website to learn the benefits of being a subscriber.